Because Your Eyes are the Window to Your Soul, they make a great guide for finding your Life Purpose, Soulmate, fulfilling Career Direction and opportunities for Big Leaps. 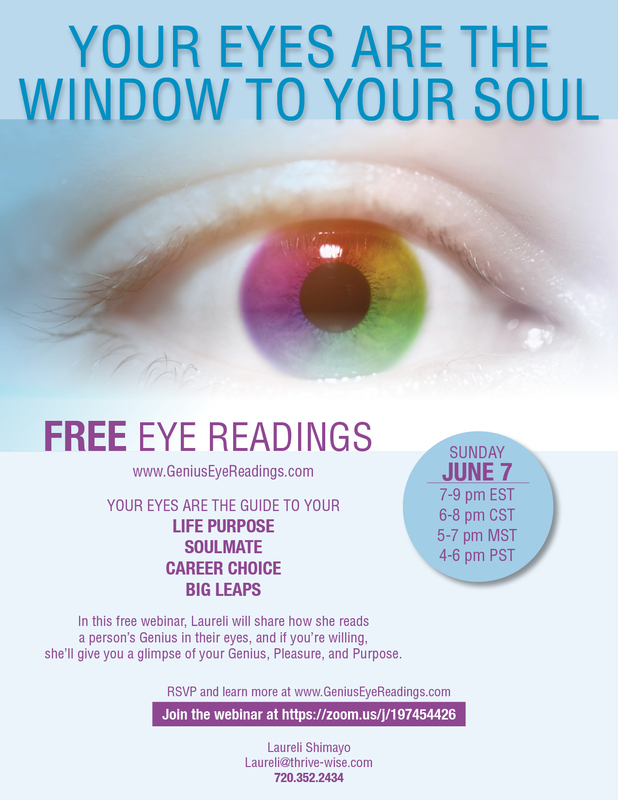 In this FREE webinar, Laureli will describe how she does Eye Readings with the 7 Talents of the ThriveTypes archetypes – the tools she uses to identify a person’s Genius. If you are interested, she’ll share a glimpse of your Genius during the webinar too. Be sure to join us by video so she can see your eyes! And if there is time, she’ll look at your photos of others in your life as well. Learn more about Laureli and ThriveTypes. Laureli has been using ThriveTypes with individuals, partners and teams for over 10 years. She is a strategic and intuitive coach and Connectress – connecting people with their purpose and fulfilling career paths, soulmates with each other, and organizations with great employees. Details on private Eye Reading sessions and coaching packages are available upon request.